Written by WeeblrPress on 01 August 2017 . I haven't posted here in a while but that's because we've been busy cooking up big new things for weeblrAMP: just a few days ago, weeblrAMP community was accepted and published on the WordPress plugins directory! Already a big news in itself, but in line with what we discussed with other community members at the last WordCamp Europe, we have also completed support of Easy Digital Downloads and Mailchimp 4 WordPress. Written by WeeblrPress on 03 May 2017 . We just had a customer asking about how to efficiently improve the structured data on their AMP pages. Being such a major SEO optimization one can make, especially for a Recipes site, I thought this would be a good example of using one of many weeblrAMP filters and actions. And so here is the first installment of our #practicalAMP series! The site in question has both a number of informational pages and then a very large number of recipes. When creating AMP versions of all those pages, weeblrAMP automatically adds AMP-required minimal schema.org structured data, and then some depending on the document type. Which is why it is important to recognize the document type, when possible. Written by WeeblrPress on 20 March 2017 . 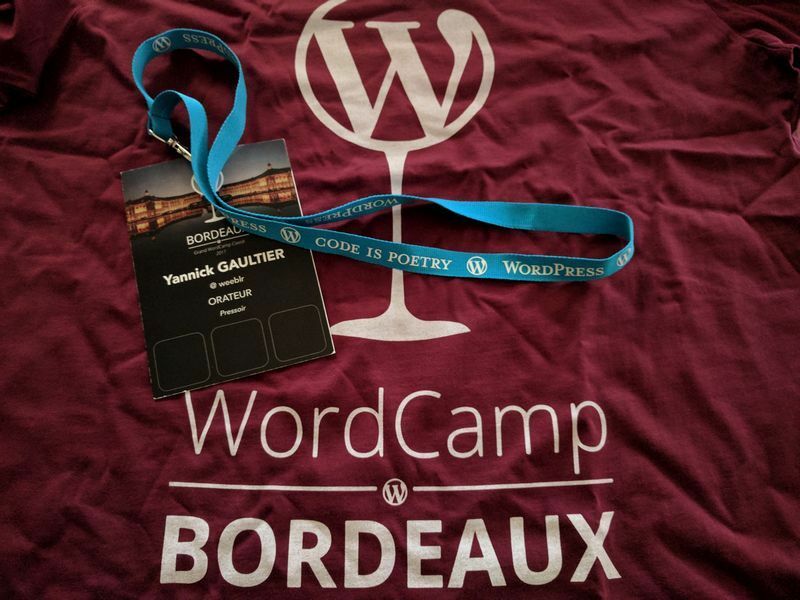 I was lucky to be invited to speak about Accelerated Mobile Pages at last weekend WordCamp Bordeaux. This was one of my first encounters with such a large WordPress enthusiasts gathering, with a crowd of 350. We were treated to 16 sessions, by a very diverse group of speakers, with some well-known developers such as Rémi Corson from WooCommerce, Julio Potier from WP Media and WP Rocket fame or Frédéric Demarle, creator of Polylang. A testimony of WordPress community variety and attractivity, we also enjoyed talks such as How to turn WordPress into an E-learning platform, merging online and print activities with a WordPress site, or using WordPress as a central information management solution. 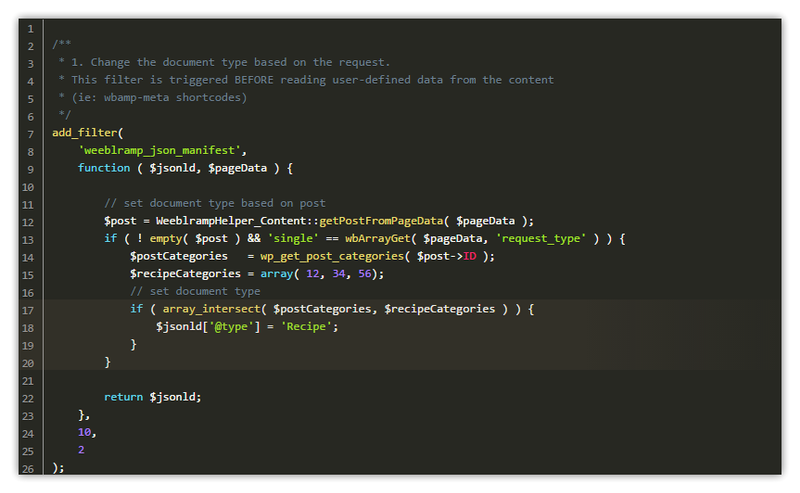 More technical talks as well, with a deep dive into taxonomies or practical code samples around migrating data around WordPress installations. The usual suspects of SEO, Social networking and contribution to WordPress were also on the list. I also found a very welcome addition Elie Sloïm's presentation of Web Quality and accessibility, based on the Opquast certification program, who reminded us most do's and don'ts are relatively simple to use, while bringing extended benefits not only in terms of accessibility but, for instance, for SEO. Written by WeeblrPress on 15 March 2017 . The title says it all: Welcome! My name is Yannick Gaultier, and I am running WeeblrPress. For nearly 10 years now, I have developed GPL-licensed CMS plugins, as a business venture for more than 7 years. While mostly working on the Joomla! side of things, our products include SEO and content-generation oriented extensions. 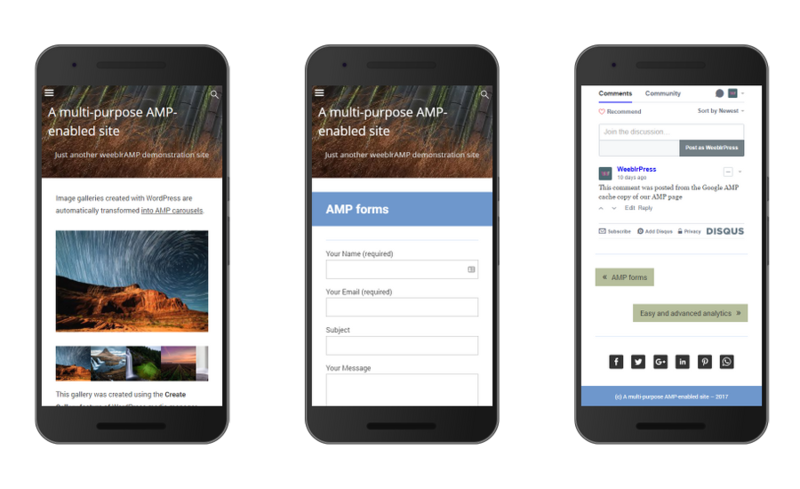 Since Google started talking about Accelerated Mobile Pages at the end of 2015, we have been very busy developing and supporting an AMP plugin for Joomla! It opened the same day Google started using AMP in their search results, and has grown since then into some kind of a standard, receiving the Joomla! Innovation of the Year for 2016 last May. With that work as a strong basis for being able to generate valid AMP pages for many real-life websites, we looked at the WordPress AMP scenery and found that despite a very large offering, important things were missing. We believe AMP is here to stay, and its usage should and will expand, bringing a lot of benefits to web site users. 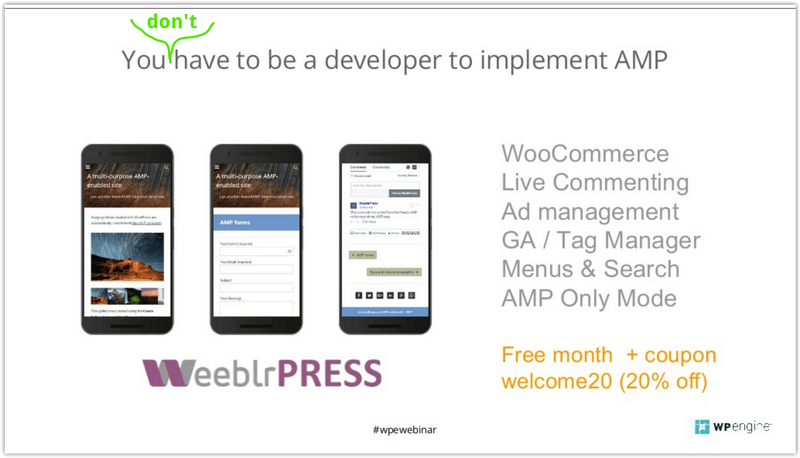 Though large publishers and e-commerce websites are already taking advantage of AMP, smaller ventures may not have custom development resources still often needed today for a proper implementation. With weeblrAMP, we hope to help reduce that gap, allowing many WordPress sites owner and developers to fully implement AMP sites in a faster and more efficient way.